Alarmed by the recent spate of violent attacks on human rights defenders in Viet Nam, the United Nations rights agency today expressed concern at the “apparent failure” of the Vietnamese authorities to investigate and prosecute the perpetrators and urged the Government to take measures to ensure security of all human rights defenders. “We urge the Government of Viet Nam to take urgent measures to ensure the security of all human rights defenders and to undertake prompt, thorough and impartial investigations of all the reported incidents involving human rights defenders,” Ravina Shamdasani, spokesperson for the Office of the UN High Commissioner for Human Rights (OHCHR), told journalists at a press briefing in Geneva. According to Ms. Shamdasani, the third such incident took place since September, when Mr. Nguyen Van Dai, a prominent lawyer and three other human rights defenders were beaten by a group of about 20 men armed with sticks at a training forum they were conducting. She added that the police attempted to halt the forum but the 60 participants refused to leave, forcing the police to stay and monitor the session, following which the attack took place. Further, Ms. Shamdasani said that in two other recent cases, in November and September, human rights lawyers and activists were attacked, apparently in reprisal for their work on sensitive cases. “We have expressed our concern to the Vietnamese authorities over these attacks and sought clarification on serious allegations that plainclothes policemen were involved,” she added. Ms. Shamdasani stressed that human rights defenders are entitled to particular protection by State authorities under international human rights law. “The relevant standards are outlined in the Declaration on the right and responsibility of individuals, groups and organs of society to promote and protect universally recognized human rights and fundamental freedoms (Declaration on Human Rights Defenders), which was adopted by the UN General Assembly by consensus in 1999,” Ms. Shamdasani concluded. 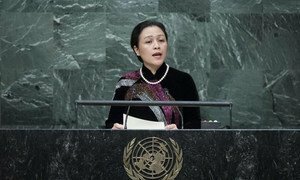 Welcoming the adoption of the bold new Sustainable Development Goals (SDGs), the Vice Minister for Foreign Affairs of Viet Nam told Member States today that “to transform our world, the United Nations needs to transform itself,” stressing that the work of the General Assembly needs to be revitalized to make it more focused, efficient and relevant.